Horizon Bay is a five-story, 30,000-square foot shared living facility located in Tampa, Florida. In 2009, when the project was in initial design, an early challenge was the project’s location: a very dense area of Old Tampa. The proposed multi-family project would occupy most of the developed site, making open space and parking hard to come by, and the engineer and owner were both looking for ways to increase “green” space. Limited available site space warranted the use of an underground stormwater detention structure beneath the facility parking lot. According to design engineer Fuxan Engineering of Odessa, Florida, underground detention was the only practical choice. 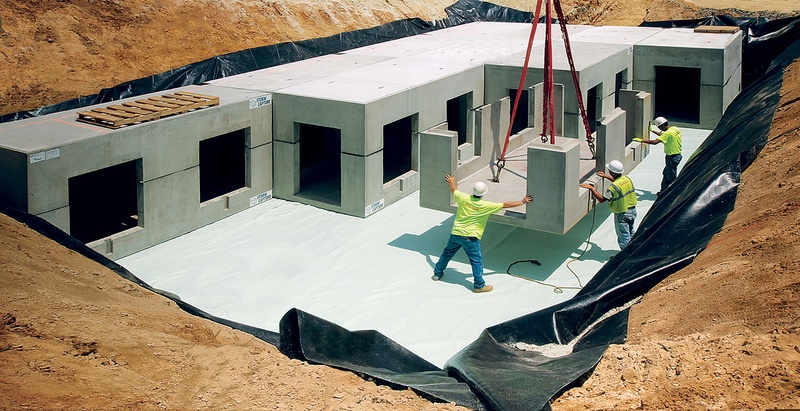 A unique precast concrete subsurface stormwater detention infrastructure needed to be specifically engineered and designed to accommodate both the stormwater storage capacity demands and the load-bearing needs of the land use above them. The system needed to be able to capture the stormwater and redirect it to 6,572-cubic feet of detention space under the parking area. An overflow pipe led to storm sewers, but the majority of the stormwater would be infiltrated back into the ground; a common Low-Impact-Development (LID) practice in Florida that serves to help recharge the aquifer. Since the detention system was going to be needed to manage stormwater runoff during construction, it needed to be installed during the first phase of construction. The StormCapture Module system was selected due to its stand-alone, traffic-bearing design that does not rely on final paving for structural integrity and associated stone underlayment for structural capacity. 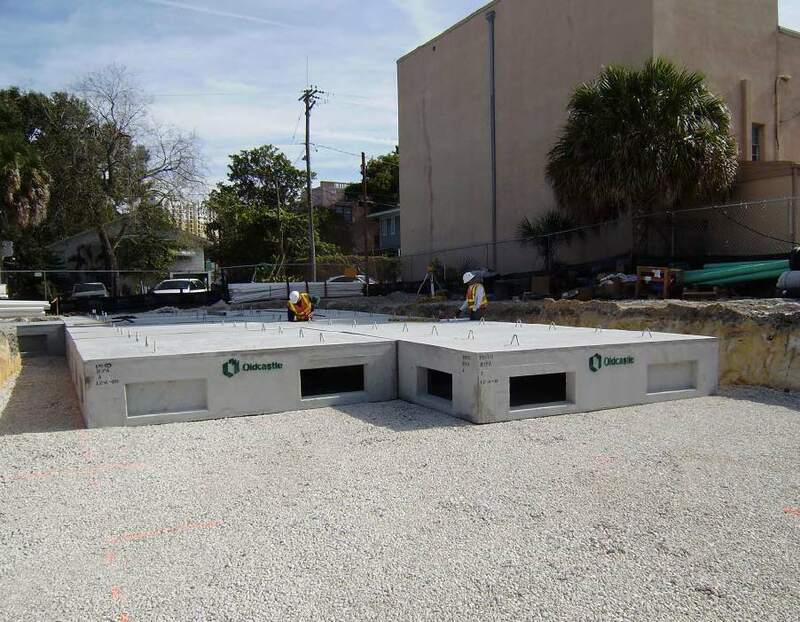 Manufactured by Oldcastle Infrastructure, A CRH Company, the StormCapture modules are constructed of high-strength precast concrete, their ability to support traffic allowed a 50% reduction in thickness of base rock required between the pavement and modules, as well as a 20% reduction under the modules, as compared to the originally planned plastic chambers. The precast modules are constructed of high-strength structural concrete. Their ability to support traffic on the parking lot allowed for a 50% reduction in thickness of base rock required between the pavement and modules, as well as a 20% reduction under the modules, as compared to the originally planned plastic chambers. Construction of the site began in October 2009 and the entire facility was completed in the fall of 2010. The final stormwater system design for Horizon Bay included 37 modules that were each constructed of precast reinforced concrete with an open bottom for infiltration. Four of the modules incorporated standard inlet grates to allow stormwater direct entry from the parking lot into the system. This eliminated the need for the four separate inlet structures originally designed into the project. A precast splash pad was installed below each inlet grate to prevent scour of the bedding material. In addition, the inlet grates are used for direct access to the modules for inspection and cleaning as needed. Each module has large conveyance windows into adjacent modules to allow flow equalization, as well as access for maintenance. 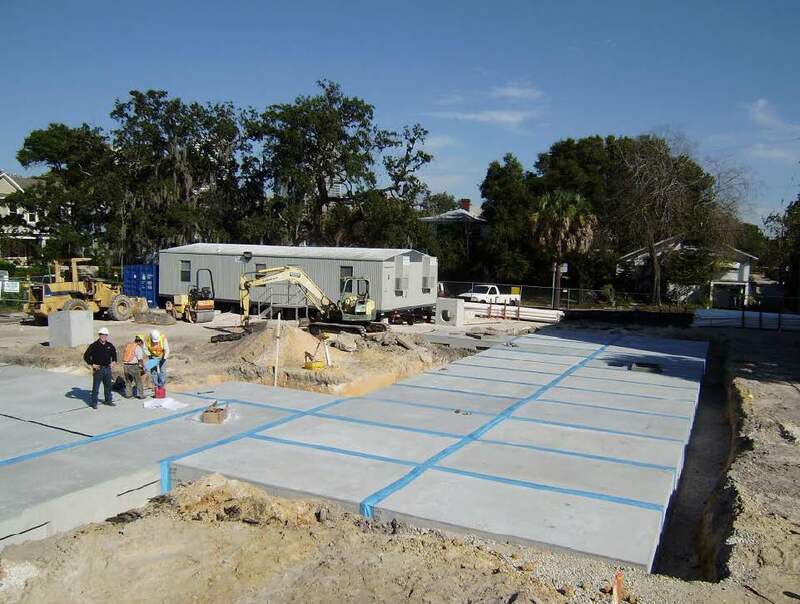 This was the first project where Ripa Construction used this precast stormwater detention module system. Ripa Construction's project managers stated that the precast modules were a key component to providing access for a very limited site and did not require ongoing maintenance or clean-out during construction. The initial savings experienced from the reduction of aggregates in the foundation, backfill and under the pavement are hard, tangible costs. Ripa believes that coupling those savings with the experience they gained in the ease and speed of installation and lack of construction maintenance will make this system very useful in future projects. The success of your stormwater management strategy hinges on choosing the right solution from the beginning. Our Guide to Stormwater Management eBook is the perfect place to start.